The railway has a very impressive fleet of steam locomotives that include some unique survivors such as an Austerity 2-8-0. The locomotive that is currently in the headlines is the recently overhauled BR Standard 4MT 4-6-0 75078, which looks quite simply splendid and as good as new! The picture above is used by kind permission of Robert Green and shows the locomotive on a loaded test run. 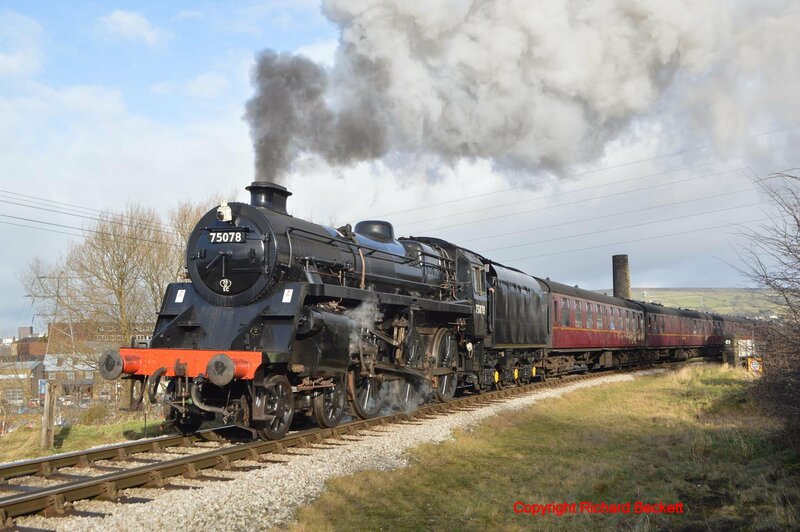 Below is a picture taken and used by kind permission of Richard Beckett and shows 75078 pulling its first service train 24th January 2015. The BR Standard class 4MT 4-6-0 class were designed in Brighton (although Derby, Doncaster and Swindon all had an input). The design was heavily based on the BR Standard class 4MT 2-6-4T tank. The lightweight design was effective and they proved to be useful locomotives despite their short careers, and eighty examples were built from 1951 onwards. 75078 was built at Swindon works in 1956. Although perfectly at home on the KWVR and built in Swindon (the former GWR works,) 75078 was constructed for use on the southern region of British Railways and was allocated to Exmouth, Basingstoke and Eastleigh sheds during its ten years of service between 1956 and 1966. The southern region locomotives were fitted with the larger BR1b 4,725 gallon tender for a greater range between water fill-ups (the southern region did not have any water troughs) and they also gained double chimneys from 1957. In these respects 75078 is similar to two other preserved standard 4MT 4-6-0’s, 75069 undergoing heavy overhaul on the Severn Valley Railway and 75079 being restored on the Watercress Line. The KWVR has an excellent blog that I heartily recommend, where more pictures and video’s of 75078 can be found, as well as regular updates from the line. Check out http://news.kwvr.co.uk/2015/01/25/75078-passenger-duty-150124/ to read more. 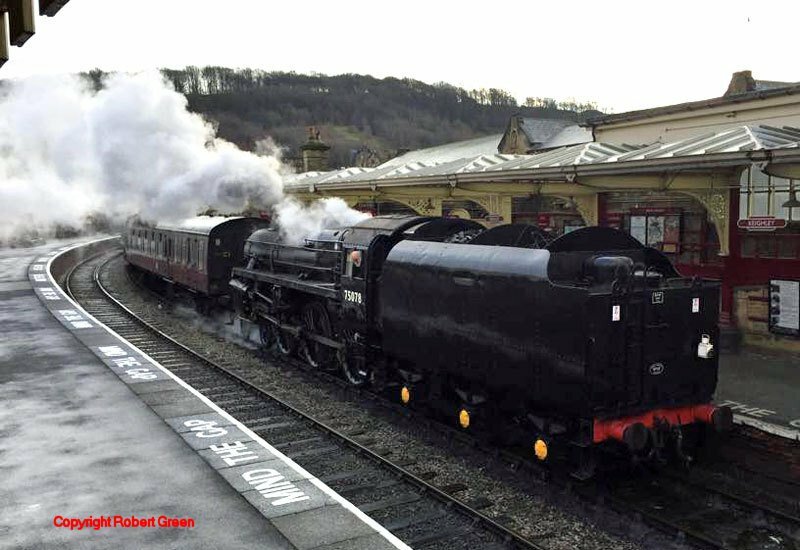 Congratulations to the KWVR and its volunteers, who are clearly doing an excellent job. With any luck I’ll get to see the line for myself in the not too distant future and see the fruits of their labour first-hand. Until then, thank you to the KWVR, Richard Beckett and Robert Green for assisting in putting this report together. ← UK Heritage Hub Issue 49 ready to download!